For the first time in Drum Corps International history in 1983, the World Championships went to the deep south, heading to Miami's Orange Bowl Stadium, which is a space now occupied by the Florida Marlins' baseball stadium. 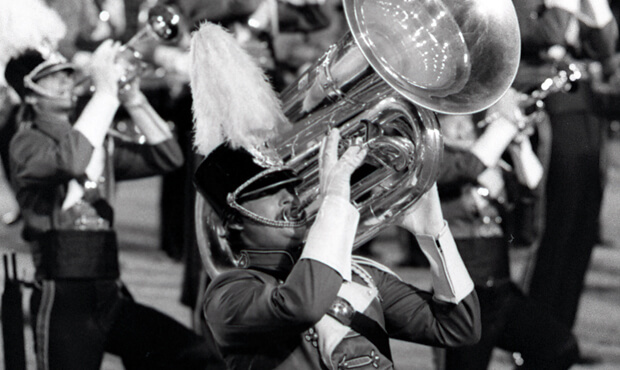 1983 marked the first time that a corps from the east, the Garfield Cadets, won the World Championship title, and also marked the first finalist appearance by the now defunct Florida corps Suncoast Sound. 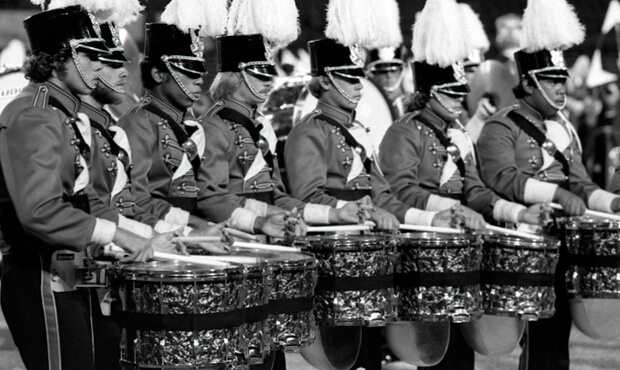 The spread between the first- and 12th-place corps was a whopping margin of 20.65 points, a record that still stands today after more than 30 years. The Freelancers of Sacramento, California, took eighth place with a program that opened with a quiet version of "Breaking Up is Hard to Do," that quickly turned into a loud and brassy fanfare. Howard Greenfield and Neil Sedaka wrote the song, which was first recorded by Sedaka in 1962 as a pop tune. When he re-recorded the tune in 1975 as a slower ballad, it resulted in Sedaka making the Billboard Top 10 twice for two different versions of the same piece. The next selection in the show was "Lover, Come Back to Me," with a melody written by Sigmund Romberg and lyrics by Oscar Hammerstein II. The song was put together in 1928 for "The New Moon," a Broadway operetta that was later turned into two different movies prior to World War II. The song became Barbra Streisand's second single release in 1962 and was re-recorded by her the following year for her second album. The Freelancers' version was treated as a rousing big band swing tune, demonstrating the horn line's versatility in multiple styles. The percussion feature with a tongue-twister of a name, "4/4 for Four," was written in 1972 by Anthony Cirone, a Julliard-trained percussionist who performed 36 years with the San Francisco Symphony while also serving as the chairman of the percussion department at San Jose State University. Originally, the work was a percussion ensemble quartet with no mallets. The corps added mallet percussion instruments to pump up the jazzy nature of the piece. Prominently featured during the selection were eight long fabric banners that split the horn line. Color guard members were featured adroitly spinning two rifles at once. The next production combined two works by the rock group Chicago, starting with a jazzy rendition of "Skin Tight" by trombonist James Pankow off the 1976 album, "Chicago X." The second part of the production, far longer than "Skin Tight," was "Introduction" by Terry Kath, guitarist and vocalist for the band. Kath was considered the band's leader until he died in 1978 from an accidental self-inflicted gunshot wound. The song, from the band's self-titled first album, "The Chicago Transit Authority," was released in 1969 and featured "Does Anybody Really Know What Time It Is?" and "Beginnings," two early hits for the group. The drum corps' rendition of the piece ended with the cymbal players forming the letter "F," for "Freelancers." The show closed with "Even Now," a ballad by Barry Manilow, with words by Marty Panzer. The tune is the title track from Manilow's sixth album, a 1978 project that reached triple platinum. The song became Manilow's ninth song to hit number one on Billboard's Easy Listening chart. The softness of the tune as played by the Freelancers was made even less angular by the color guard members spinning aqua blue and white flags attached to curved poles. Building up to a full-corps company front push, the song ended loud and bombastic, reverting to the guise of "old-school" drum corps. For this week only, you can save on the Legacy Collection DVD that contains this complete Freelancers performance, along with all finalists from the 1983 DCI World Championships. Discount DVD offer ends Monday, Dec. 15, 2014.